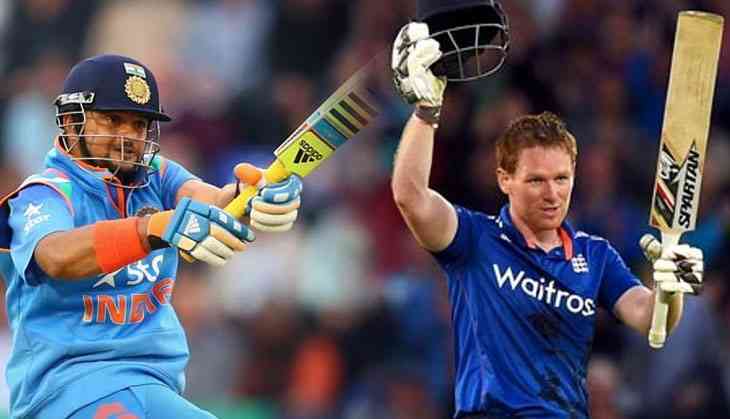 Home » cricket news » India Vs England, 1st T20: Will Suresh Raina be able to break this record of Eoin Morgan at Manchester? Virat Kohli's led Indian cricket team gear up for the tough English test begins with the first T20I at Old Trafford, Manchester on Tuesday. Indian cricket team has reached England for the summer’s main blistering event which will comprided of three T20s, three ODIs and the most awaited five Test games. If we talk about the no of sixes hit between India and England he is none other than Eoin Morgan. He is on the top of the list with the 17 sixes he smashed over the row. The King of six Yuvraj Singh came at no 2 with 15 sixes he amassed while Suresh Raina, the T20 specialist hits 14 sixes over the row. India and England have faced each other in 11 games where India registered their win in 5 games while England has won 6 games. However, India failed to secure a win in England. Both the teams are in excellent form. India clinches the series against Ireland by the 2-0 margin, on the other hand, England thrashed Australia by 5-0 margin. Both the teams have pace, spin, and strong opening batting line-up. Also Read: Here are the reasons why Rahul Dravid is being inducted into ICC Hall of Fame before Sachin Tendulkar?